Making their own contribution to this busy week of GPU and gaming news, this evening Intel took the wraps off of their previously teased new graphics control panel. 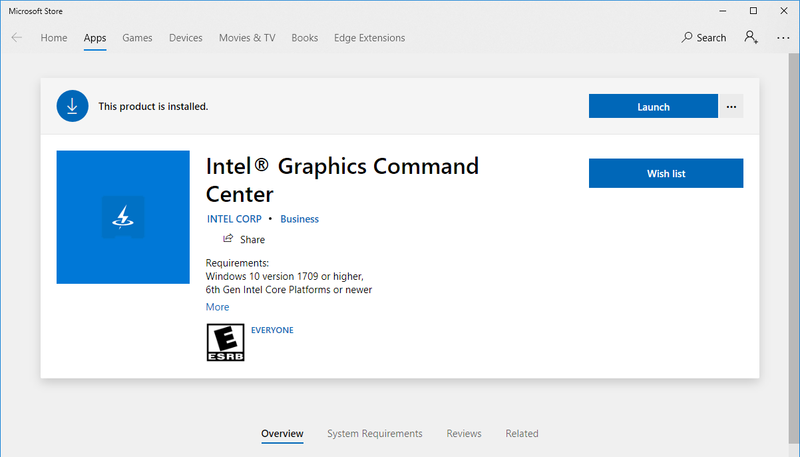 Dubbed the Intel Graphics Command Center, the new control panel – or to be more technically accurate, the new app – is an effort from Intel to modernize a part of their overall graphics infrastructure, replacing the serviceable (but not necessarily loved) current iteration of the company’s control panel. At the same time however, it’s also the first step in part of a larger process to prepare Intel’s software stack and overall software ecosystem ahead of the company’s ambitious plans to enter the discrete GPU market in 2020. Starting from the top, Intel’s Graphics Command Center is largely cut from the same cloth as other modern graphics control panels, such as NVIDIA’s GeForce Experience and AMD’s Radeon Settings application. Which is to say, it’s designed to offer a highly visible and streamlined approach to a GPU control panel, making various features easy to find, and overall offering a more user-friendly experience than the company’s current control panel. And while Intel doesn’t go so far as to name names, from their presentation it’s clear that they consider this kind of user-friendly functionality to now be a required, baseline feature for any GPU ecosystem; in which case Intel is (or rather now, was) the only PC GPU vendor lacking an equivalent application. To that end, the company is launching the new Graphics Command Center as part of their efforts to better support their current users, as well as new users going forward. The Intel Graphics Command Center works with 6th Gen Core processors (Skylake) and later, which at this point is most Intel-powered systems sold in the last few years. The company calls it an “early access” release, and this is a fairly apt description for the utility as while it shows a level of polish and stability that comes with over a year’s work, Intel clearly isn’t done adding features to it yet. But perhaps the most interesting tidbit about the Graphics Command Center is how it’s being distributed: rather than being bundled with Intel’s drivers, it’s being delivered through the Microsoft Store on Windows 10. Yes, it’s a full-on UWP application with all of the “modern” flourishes that come with it, and this is actually an important part of Intel’s strategy. Because Microsoft’s new DCH driver model requires drivers to be stripped down to the bare essentials and delivered in pieces – graphics control panels can’t be bundled – these sorts of applications instead need to be delivered separately. In which case, using the Microsoft Store lets Intel tap into the OS’s built-in software update functionality. It also means that the control panel isn’t contingent on the checkered driver update schedules of PC OEMs; users can always download the Graphics Command Center out of band. Overall, the Graphics Command Center borrows a lot from other GPU control applications. 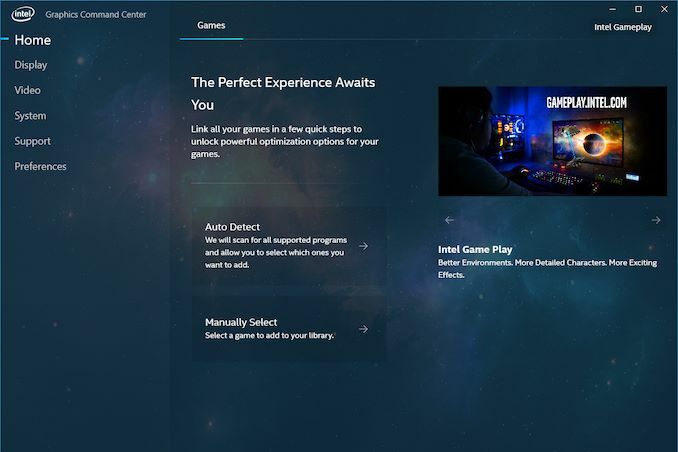 Front and center is a games-centric approach to settings, with the application preferring to offer game-specific settings when possible (scanning to discover what games are installed). For one of the 100 or so games on Intel’s list of supported games, this is relatively straightforward, and each game gets its own page with familiar driver-enforced settings such as anti-aliasing, v-sync, and anisotropic filtering. Meanwhile, Intel has also thrown in some functionality to better explain what these graphics settings do, as well as their performance impacts. A small question mark next to each setting describes what the setting does, and includes photo demonstrating the concept as well. Meanwhile, towards the right of the control for that setting is an indicator to signal the performance impact of that setting, to offer a basic level of guidance about what the current setting will likely do to game performance. This is actually dynamic with the setting itself, so higher levels of MSAA are flagged as causing a greater performance hit, etc. Going one step further, however, for 30 of those games, Intel also includes support for one-click graphics optimizations, which is indicated by the lightning bolt logo. Similar to how this works with other control panels, this function will actually go into a game and alter its settings to Intel’s suggested settings for the host computer. This allows Intel to adjust game settings on a fine-grained level, adjusting texture and shadow quality, rendering distance, internal AA settings, etc. I’m told that right now most of the work to determine these settings is being done by hand by Intel engineers – and of that, I assume a lot of it is being taken from Intel’s existing gameplay settings service. However with 3 generations of iGPUs supported and more coming, the use of automation is increasing as well. As to the quality of Intel’s suggestions, I haven’t had nearly enough time with the Graphics Command Center to get a feel for them, though Intel makes it pretty easy to undo it as necessary. Beyond game settings, the Graphics Command Center also supports all of the other common features you’d expect to find in a graphics control panel. There’s monitor display settings such as resolution and refresh rate, as well as arranging monitors. There are also a series of video quality settings for adjusting color correction, deinterlacing, film detection, etc. Not unlike the graphics settings, there are demo/explanation features here as well, in order to demonstrate in real-time what the various settings do. And of course, there are info panels on the current software and hardware, supported features, etc. This latter part is admittedly nowhere near groundbreaking, but if this is a baseline feature, then it needs to be present regardless. 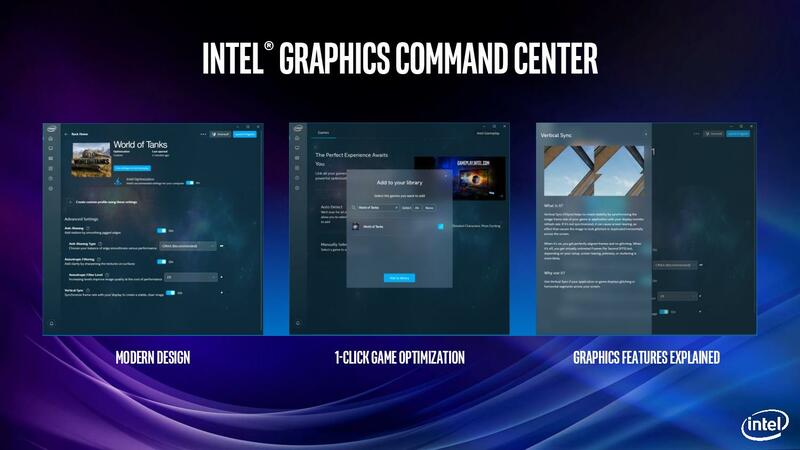 Past the current functionality, it’s clear that Intel doesn’t consider themselves to be done with the development of their new graphics control panel. Besides adding support for more games – both for detection and one-click optimizations – there are several other features the other GPU vendors regularly support such as game recording. Performance monitoring, and game streaming. So I would be surprised if Intel didn’t eventually move towards parity here as well. But ultimately the launch of their Graphics Command Center is about more than just improving the present; it’s about laying the groundwork for the future. The company is gearing up to launch it’s Gen11 iGPU architecture this year, and all signs point to the most common GPU configurations being a good deal more powerful than the Skylake-era GT2 configurations. And next year, of course, is slated to be the launch of Intel’s first Xe discrete GPUs. Intel has grand ambitions here, and to compete with NVIDIA and AMD, they need to match their software ecosystems as well, not just match them on the hardware front. So their latest control panel is an important step forward in establishing that ecosystem. For the time being, however, Intel is just looking to polish their new control panel. 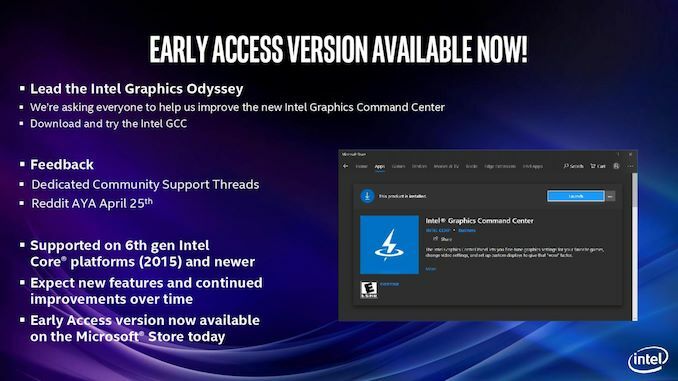 As part of their Odyssey community feedback/evangelism program, Intel is very much embracing the “early access” aspect of this release, and is courting user feedback on the application. And while I admittedly suspect that Intel already knows exactly what they want to do and work on, it certainly doesn’t hurt to solicit feedback on this long road to Xe. So here comes the Microsoft software tax: Everybody has to pay Microsoft extra for running applications on "their" operating system. The EU has fined Microsoft for far less monopolistic behaviour and I sure hope they react with speed and with sufficient billions to kill the incentive. I was very sure, that I'd never use the Microsoft shop, but now I risk usability of my systems without, half of which don't even include the shop, because they are running the server variants of Windows. I cannot say that I care about Intel graphics, but since Microsoft seems intent to force the shop hook down everybody else's throat, this was the time to say it. I am sure that Al Capone had others who emulated him: That didn't make their actions legal or morally right. I am not alone to consider Apple's store an illegal monopoly, there are court cases pending from what I have read. I never had any computer from Apple and most likely I never will because of their iJail approach, that denies you full control over hardware you buy from them (store, right to repair, rooting). That's not the case with Android: I can operate my Android phones without Google, put on custom ROMs, root etc. You can see Google itching to take more control, but the EU thankfully seems willing to keep them in check. Both set their policies when they started and both have not changed them, so you can make an informed choice, especially since those choices typically last much longer than the life-time of a single device. In the case of Windows Microsoft has had to unbundle media players and browsers from their operating system, because both were correctly seen as being detrimental to application competition. Microsoft's pressure on software and hardware vendors to switch to a channel they exclusively control, means PC owners need to chose between using the Microsoft store or having control e.g.over their graphics settings, perhaps 30 years after committing to the platform. That is quite simply abuse of power. Huh? You can download apps from the store without an account. Yes, it bugs you to log in. No, you don't need one.